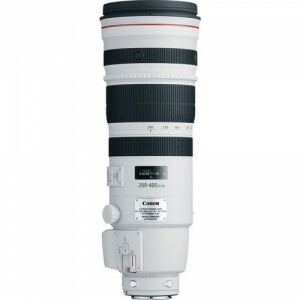 The Canon EF 200-400mm f/4L IS USM Extender 1.4x is a unique telephoto zoom lens for Canon full frame and APS-C Digital SLR cameras. It is a constant f/4 aperture throughout the 200-400mm zoom range making it a very good option for wildlife photographers. But what really sets this lens apart is the built in 1.4x teleconverter. This makes the lens a 320-560mm f/5.6 lens without having to take the lens off, mount a converter and remount the lens on the body. However, at $11,000 it is not a lens that will find a home on most photographer’s kits, but will be a great rental option. I have not tested this lens yet, but really want to soon. From what I have seen the image quality is very good and if you are a wildlife photo enthusiast this is one of the “must have” lenses. based on 51 user reviews online.